Snapshot history. It has become the way we mark historical time. From political activism to sensationalist journalism, the immediacy of the photographic record underpins much of our historical awareness. It is perhaps no wonder that history sometimes becomes undone, with its shaky claim to spontaneity and mechanical responsiveness. Taken shortly after the second plane hit on 9/11, the snapshot above went intriguingly unnoticed for months. Like a holiday snap, it shows sunbathing New Yorkers, appearing oblivious to the history unfolding behind them. And that, in part, is what makes it so scary. At a time when history was increasingly being documented instantly, the American state sought to quickly compile a photographic record. 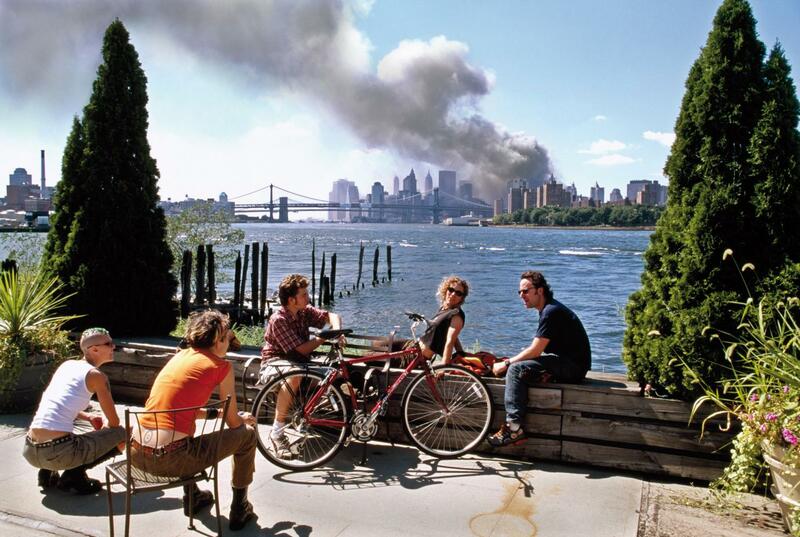 Thomas Hoepker became one of the effective ‘official photographers’ of 9/11 and its aftermath. A lot of his documentary photography made it into the archives that would frame the event for years to come. This photograph, however, was elided from the original formation of the historical imaginary which consisted of photographic archives constructed at the time by photo-journalists. It resurfaced a few years ago and has since been used recurrently as a backdrop for anxieties about nationalism and historical memory. The simple questions it raises—why? how?—open a window into the West’s temporal imaginary and the crises of power in the visual sphere. Right-wing critics, playing their parts in the cultish US anniversary culture, first seized on the photograph around 9/10/20061: What was repeated, here, was a fear of the photograph’s ‘statement on contemporary American morality and culture.’ America had become short-sighted, inattentive, pleasure-seeking and uncaring. The photograph seems to display a ‘forgetting’ of the event even before it is over. The fear it evokes, according to the New York Times article which addressed it then, is not of destruction, not of a wound or a trauma, but of a disturbing invincibility: ‘The culture, for better and worse, survived intact. It took only four days for television networks to restore commercials to grim news programming.’2 At a time when the right wing was seeking to maintain resolve regarding Iraq and to force an absurd retributionist ethic upon its own country, it attacked an image that seemed to betray apathy instead of the fear it wished to cultivate. And within this lies the right wing’s fear: that the population had become somehow inured to history. Complementary to this trend was the Bush administration’s departure from the previous neoconservative ideology of the ‘end of history’. While both Bush and Reagan had declared ‘war’ on ‘terror’, sustaining a good/evil conflict narrative, we can see here part of what WJT Mitchell describes in Cloning Terror. The War on Terror was, he outlines, an attempt to make the postmodern real; to make a war of images concrete; to react to iconoclasm with war; to flee the malaise of complacent, naturalised neoconservative post-history and reach an even more reactionary world of fantasy.3 The ‘War on Terror’ would bring a meta-narrative back to the table, but it would only do so by proposing a cyclical narrative (as Mitchell has it, a narrative of cloning): by attacking the ‘Terror’ they in effect perpetuated, they would spawn an endless war. As Adam Curtis elegantly summarises in The Power of Nightmares, far right republicanism became the very mirror of the terror it fought. The clone of its own enemy, locked with it in a cyclical fantasy war that endures to this day. This image seems to internalise death in the culture, making an absence present—much like Poussin’s Et in Arcadia Ego. As Poussin’s peasants discuss an ambiguous epitaph, the sentiment of the title is that even in paradise, death is present, even if forgotten. The unacknowledged disaster, disrupting an urban idyll, seems to visually act like this monument to death. There is a sense here of the marked but inarticulable, a crack in the window that starts to disturb the view. In a timeless arcadia, death appears as if both present and absent: a ruined but insistent fragment. Crises of forgetfulness, and of mobilising affective disaster, are crucial to unpacking Hoepker’s image. In a postmodern war, amid anxiety over the reproducibility of fact and fear, ‘history’ itself becomes an object of unease. While many, to this day, are invested in keeping the memory of the holocaust alive—and, indeed, separate from critical historical reflection so that it can still be experienced emotionally as a trauma—Hoepker’s image seems to precede the affective event itself. History here seems to precede memory. The deadening and normalising effect of text and recording overwrites disaster, seamlessly joining 9/10 and 9/12. The sunbathing crowd of smiling youths—like any bucolic arrangement of shepherds between cypress trees—has already forgotten the event. There is no awareness of death in this arcadia: the smoke is practically a separate picture, like a backdrop in a photographer’s studio. It is not a tragedy receding in time, but one whose snapshot-documented emotional response never happened. Were it part of the archive documenting 9/11, such a picture would challenge, even unravel, the honesty and truth of all other images. Indeed, it could begin to unravel not just national unity, but the imaginary of history. There is a fear, quite separate from the conservative fear-mongering, that history fades too fast, and that any project to resuscitate it is doomed before it can begin. The most immediate impression of the moment appears vacant, as if death has been internalised. 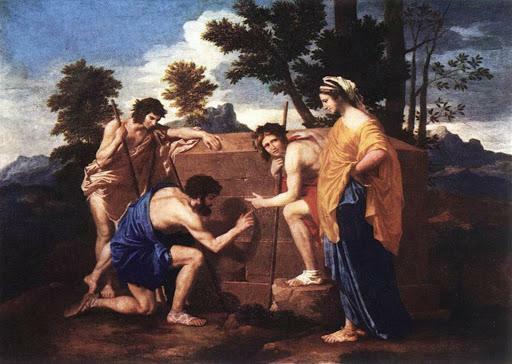 Poussin’s peasants struggling to understand death in paradise are missing the point: death is already there, arcadia is a lie. Its timelessness is not a blessing, but a frozen moment in which we find death. The subjects of Hoepker’s photograph have since come out in defence of themselves, as if the image were an attack on their own characters. The image was read by all audiences (citizens, critics, photographers and politicians) entirely as an objective account of events, to be judged on the basis of its subjects, and all the more problematic for the ambiguous fuzziness it had immediately seemed to represent. The Guardian repeated this view,5 again reading the image simply as a testament to the seemingly natural property of human memory to ‘fade fast’, thereby mirroring Tony Blair’s appraisal: “It is amazing how quickly shock is absorbed and the natural rhythm of the human spirit reasserts itself”. However, the subjects tell a different story. In their words, they were at the centre of a far-reaching debate on the ramifications of the disaster unfolding behind them. They were emotionally affected by it from the moment it happened until the present day. Part of what is missing in the discourse surrounding the photograph, then, is what the photograph itself seems to miss: the sense of its wider nature as a cultural artefact, as opposed to a transparent record. The establishment’s immediate fear about the photograph was actually a fear that it might expose the fantasy of the ‘War on Terror’ for what it is: a ‘Clone War’ that pretends to move history forward, while actually suspending policy and culture in a horrific dead end, cycling through the same over-simplified narrative of ‘good versus evil’, again and again. Almost the poetic nemesis of the ‘end of history’, the neoliberals find themselves trapped in a nightmare of unending war, where the reactionary generation before it thought itself sleeping in a period of eternal prosperity. While the government brought this nightmare into being, it did not want its population to be shocked awake. It felt the need to redirect attention from the photograph as cultural object to a moral indictment of its pictured subjects. However, as effective as I think this image is in unravelling this historical programme, it also prompts further readings, which render it even more problematic for our perception of the relation between history and memory, and the difficulty of recording affective encounters, in a more meaningful way than Poussin’s shepherds in Arcadia. How, he asks, can we capture history? How can the affective moment of trauma be preserved, and what happens to it when it is recorded in historical narrative? In a sense, a photograph fails to capture a living conversation; it fails to actually gather the community around this disaster and record the actual dialogue it is engaged in before the camera. The photograph misses its very subject. Instead, whatever atmosphere exists in the rigid, almost classical, composition consists entirely of smoke leaking out on the horizon. While this punctum seems oddly displaced from the bucolic figures considering it, its unsettling voluminousness disturbs us in a productive way. By bringing us back to a moment of crisis in the national historical imaginary it keeps the wound open on a critical, reflective level. Again and again we ask what we have forgotten: again and again we prompt ourselves to introspect. We resist totalising archival knowledge, as well as the American state’s attempt to make images concrete. It resists historical certainty itself, at the same moment as it resists the American Right’s project to convert an affective disaster into a historical narrative. As if mobilising a deranged simulacrum, it undermines the viewer’s access to even the most unmissable, unforgettable, iconoclastic attack. Like an avenging postmodern ghost, it denies that history is accessible to affect before we narrativise it, and that affect is lost in the process. At its most bleak it takes the melancholic to its extreme in the realm of history: even that which seems present is ultimately irreclaimably absent. Moreover, it was never there. All of history is here articulated as a retrospective inscription rendered intangible by its ambivalence, its banality. History hasn’t ended, but in some ways it was visible as always already dead. This is not a photograph that questions the morality of a generation or a group, as so many critics have thought: it questions a discourse. The wound, the image, the history, are all left heaped together in a picture that is cramped yet dangerously thin—a pallid and wan imaginary, like a dead skin. Merlin Seller is researching the philosophy of photography for a PhD in Art History. He is currently working in the Pitt Rivers Museum and as a researcher for the arts therapy group evaluator CDAN. W. J. T. Mitchell, Cloning Terror: The War of Images, 9/11 to the Present, (University of Chicago Press, 2010) p. 162. Frank Rich, ‘What Happened to the America of 9/12?’, The New York Times, 10/09/2006.